In this piece from Mountaineer magazine, learn how to improve your balance and speed through one-legged deadlifts. Most hikers and climbers want to improve balance and increase speed for easier travel in the mountains. For many years I've recommended the one-legged deadlift and its variations as a powerful exercise to build ankle, knee and hip stability. The Open Book T variation is an advanced balance move combining Warrior 3 and Half Moon poses from yoga, with internal and external hip rotation. It reminds me of graceful figure skaters who glide effortlessly across the ice, leg extended behind them parallel to the ground. This exercise strengthens the gluteals, hamstrings, and adductors - those posterior chain muscles in the back of the body that extend the hips whenever you make a high step, travel uphill, or power forward on the trail or a bike. The lower back muscles also help to stabilize and hold the body in position. The hip abductors and external rotators work with the VMO (the inner teardrop shaped muscle in your quadriceps) to stabilize the pelvis and the knee of the supporting leg as you perform the movement. In short, it's a great compound movement that incorporates multiple muscle groups simultaneously and challenges your balance in an integrated, functional way. 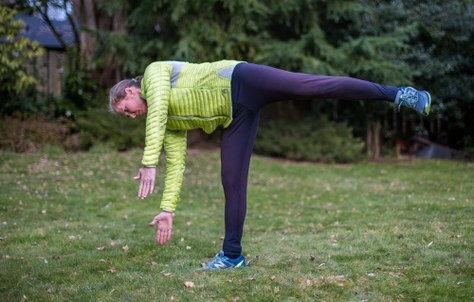 Stand on one leg with a slight (no more than 20 degree) knee bend. Focus on keeping your weight evenly distributed among the tripod of your big toe, pinkie toe and heel. Keep abdominals tight so that you prevent rounding or overextending the back. Cast your eyes forward and hold your torso in a straight line from shoulders to hips. Holding a neutral spine and keeping hips squared to the floor at all times, slowly bend forward at the hips while maintaining a slight knee bend in the standing leg. Think of pressing the hip of the standing leg backward, or dragging the floor underneath you in order to activate your hamstrings. Allow your arms to hang loosely in front of you (you can hold a dowel or light dumbbells to keep your torso level). Your back leg should stay in line with the torso as you hinge forward. From this T position, engage your obliques and glutes to raise and lower the unloaded hip (as in Half Moon) keeping shoulders and hips aligned at all times and torso and elevated leg parallel to the floor. Avoid rotating through the upper torso only. The hand on the side of the grounded leg should not move at all. Slowly raise and lower the airborne hip 3-8 times, then repeat on the other leg. If you feel any stress in the lower back, rest and stretch between sides. To increase the balance and strength challenge for the hips and lower back, when you feel you can perform the movement smoothly on both legs, and get into and out of both the dropped and lifted hip positions, add a dumbbell in each hand. For more how-to exercises and nutrition tips for the outdoor athlete, visit Courtenay Schurman’s website or send her a question at court@bodyresults.com.